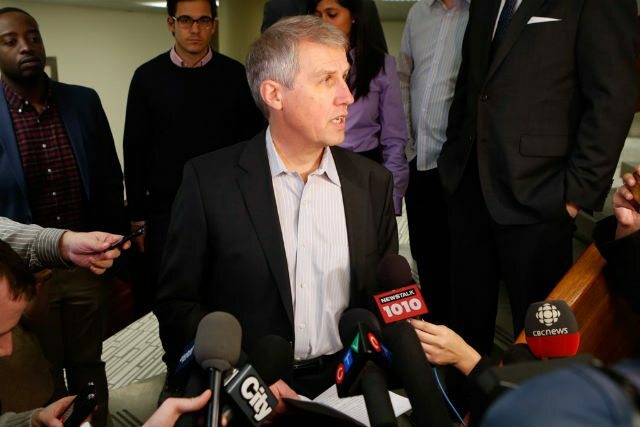 In a recent speech at the Board of Trade, mayoral candidate David Soknacki floated several ideas for economic stimulus and fiscal responsibility in Toronto. David Soknacki speaking to reporters at City Hall the day he launched his mayoral bid. Though residential property taxes get the vast majority of media coverage, there are actually several property classes in Toronto, and they aren’t taxed at the same rates. Back when Soknacki was budget chief and David Miller was mayor, council took a look at the relative distribution of taxes among the property types—the others are multi-residential, commercial, and industrial—and determined that businesses were paying too much relative to homeowners, and that this was hindering our competitiveness. In 2007 council passed a new policy to gradually change the ratio between residential and non-residential property taxes; that process will continue until 2020. When it comes to Toronto’s relationship with neighbouring municipalities, Soknacki said, “we need to focus on building regional markets, instead of focusing on regional marketing. If we succeed at the first, it’ll be much easier to succeed at the second.” He criticized regional cooperation efforts as they are happening right now for their superficiality—a question of general boosterism rather than initiatives that substantially change how businesses operate. Soknacki cited Metro Vancouver as an example of a more robust approach, as the municipalities there “recently signed what amounted to a civic trade deal. They agreed that a business license bought in one metro municipality was equally valid in all of them. I believe we can experiment with the same approach to develop practical trade relationships, building webs of inter-city cooperation in the GTA and then elsewhere.” Soknacki also wants to look at sharing services between GTA cities, and forming strategic alliances when it comes to matters like construction and procurement.